Belgian cyclist Frederiek Nolf has died in his sleep only hours after riding the fourth stage of the Tour of Qatar. The 21-year-old was a member of the Topsport Vlaanderen-Mercator team, which has now pulled out of the event. "Our thoughts are with Frederiek's family, his girlfriend and his mates," said a team statement. As a mark of respect, Thursday's fifth stage has been shortened to 40km and neutralised, meaning that it will not be contested by the riders. British cyclists Mark Cavendish, Bradley Wiggins, Roger Hammond and Ben Swift are among the riders involved in the tour, which finishes on 6 February. Seventeen teams have taken part in the six-day race. Nolf turned professional in 2008 and the Tour of Qatar was his first race of the new season. He finished 90th in Wednesday's 141-kilometre stage four to Madinat Al Shamal, which Cavendish won. The cause of death is not yet known, but team manager Christophe Sercu said he was not aware of Nolf having any health problems. The team has now quit the Qatar tour and returned to Belgium. 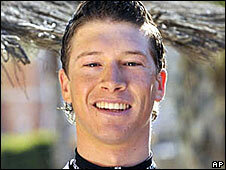 The last professional rider to die during a race was France's Fabrice Salancon, who passed away in his sleep at the age of 23 during the Tour of Germany in 2003.